Working wider begins with thinking beyond today’s boundaries. Over three posts, we’ll explore how Apple grew by blowing away traditional boundaries of product, service and content strategy . Stephen Elop, the new CEO of Nokia, recently issued a memo to Nokia employees where he compared their predicament to that of an oil worker trapped on a burning ocean rig. In actuality, the flames licking Elop’s feet are fueled by Apple’s iPhone/iPad and Google’s Android platforms. Subsequently, Nokia and Microsoft announced they will team up. The first image that comes to my mind is that of Walter Mathau and Jack Lemmon in Grumpy Old Men…but I digress. As described In Apple Business Strategy 2011, Apple is devoting 2011 to milking profits through incremental improvements to their integrated platforms. By tracing the arc of Apple’s strategy, we can see how they’ve evolved from a traditional hardware platform company (Macintosh) into a fortress of integrated products, services and now content, beginning with the iPod/iTunes combination, now extended by the iPhone and iPad. In three consecutive posts, we’ll explore the cornerstones of Apple’s transformation. 1. Pacing for Profits – Apple sets a deliberately moderate pace that extracts disproportionate profits while simultaneously creating demand “tension” in the marketplace. 2. Create Compelling Customer Experience – Apple platforms create new customer experiences whereas competitors aggregate existing best practices. 3. Passion for Minimalist Perfection – If there is a “secret sauce” that Steve Jobs personally infused into the company, it is his passion for minimalist design and perfection. Before starting with Pacing for Profits,” let me note that the “how” of strategy is often denigrated as tactics; or at best, strategic alignment. That so misses why Apple is successful. This same thinking separates hardware from software, or products from services. Apple product designs and business strategy teach us that such separations are cognitive conveniences that obfuscate the realities, and indeed, value creation opportunities, offered by a unified perspective and experience. In the U.S., the iPhone was available only from AT&T. The product was so compelling that AT&T shared a percentage of their monthly service revenue with Apple. This was unheard of at the time. It was aggressive. So much so that it was later set aside. Be bold and adjust when necessary. This is Apple’s standard operating procedure. The same strategy is playing out today in today’s headlines with Apple’s announcement of their new iTunes/iPad subscription strategy. Apple is driving new iPad media subscriptions through iTunes where they take a 30% cut. They are also telling merchandisers such as Amazon that they won’t allow customer purchases within their iPhone/iPad apps. Instead, all purchases will have to go through iTunes where Apple will get 30% of every sale. Are publishers and merchandisers pushing back? Of course, but a few aren’t. Keep in mind that despite the new Android tablets coming down the pike, at this point the iPad is far and away the dominant tablet in customers’ hands today. Apple’s hardware success gives them the license to be pushy with content distribution. This is a classic example of Apple’s integrated fortress. Just as they used the iPod/iTunes combination to become the world’s largest music distributor, they are now seeking to grab a share of digital content revenue through the iPad’s market share. Will Apple win or can publishers hold out is the wrong question. Some will sign up today but many will hedge their bets and bank on the onslaught of Android/other tablets. What I can guarantee is that once Apple faces sufficient competition, they will modify their terms. Today’s action is an opening bid. Apple made a similar pivot once Android’s handset market share threatened the iPhone’s dominance. As noted in An Attractive Platform Ages, adding Verizon as a carrier was as important for Apple to sustain its position as it was for Verizon to attract and retain customers. In the meantime, Apple will unleash a flurry of incremental products when iPad competitors introduce their first generation products. Just as they followed the iPod Classic with the Nano, Shuffle and Touch, Apple will position incremental products at higher and lower price/value points. This will occur in the iPad and iPhone product lines, most likely centered on smaller and larger form factors. 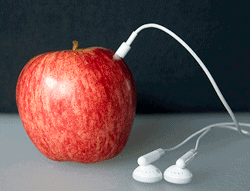 In turn, the new devices will increase the dependence on Apple’s iTunes for “feeding” and synchronization. You can also expect a richer version of MobileMe that will create further entanglement. This is the Apple dance. New platforms are their haymaker punches. They don’t come that often. The volume of revenue is made is through the every widening mesh of hardware, service and content. As described in Apple’s Most Obvious Secret, the Apple dance tempo is a patient waltz. By dribbling out a series of compelling but contained improvements, Apple extends each platform’s revenue stream as they control costs and engineering capacity. The iPhone 4 added a second camera and fabulous display to the iPhone 3GS – enough to entice but contained in ambition, cost, engineering resources required and supply chain demands. ITunes added features such as the Genius playlist tool. Apple’s deliberate pacing also eases new technology adoption. Cell phones use one of two protocols: AT&T/GSM (72% global share) or Verizon/CDMA (12% global share). Each protocol requires unique circuitry. So-called “world” or dual-mode phones require chips which contain both protocols. The Verizon iPhone 4 has the latest Qualcomm chip that is capable of using both protocols but Apple did not empower it. The Verizon phone only works on CDMA. There are several reasons for this choice. First, the technical complexity of a world phone requires more time and testing than a CDMA only version (e.g. antenna, RF issues, logic software, etc.) Apple focused on what was essential – Stopping Android’s unimpeded share gains with an already solid product. Second, leaving GSM turned off protects their AT&T relationship. A downside to a CDMA only phone is that it has limited use internationally. This reduces the likelihood some AT&T customers would defect. Third, when Apple introduces a dual-mode phone, a big chunk of the design is done plus they will have benefitted from experience with the chip family and Qualcomm. This is smart platform evolution as detailed in The Attractive Platform Strategy. Last, Apple’s tempo is a major contributor to their market mystique. All consumer electronics customers face the question of “should I buy now or wait for the next iteration?” Constantly restraining their pace increases this tension. Augmented by legendary secrecy, selective leaks and brilliant advertising, Apple customers are constantly on edge; drooling for what’s coming next. Since writing Fast Cycle Time (Free Press, 1990), I’m constantly aware how many readers and students oversimplify the competitive value of time to market on two dimensions. First, their bias is faster is always better. Not true. The most effective measure of time-to-market is time-to-value. Second, leaving a market too early is foolish. While fully supportive of culling products before your competitors do, moving too much faster than the market takes one out of the sweet spot of revenue and profits. In our next post, we’ cover the second cornerstone: how Apple creates new customer experiences and by doing so, blurs the distinctions between product, service and content.